This week was training camp, which was set to be nice and also painful. I arrived in the early afternoon – just in time for a medium length run. The run was only 7.6 miles, but there was a climb of 1100 feet within the first couple of miles. Some parts were so steep that it was necessary for us to walk – man hills are hard! The route itself was muddy and slippery, so much so that my new trail shoes weren’t fully able to cope with the terrain. This run took 83 minutes with a slower pace of 10:58 min/mile, but the view at the top of the hill made it worthwhile. The next day I rather foolishly agreed to go for an “epic run” with a couple of the fittest men – this may have been the mistake that lowered my performance for the rest of the week. The run started the same as the previous, climbing up the same hill, but then we ran down the hill (hard on the legs) and up the other side of the valley to a second and third peak, with a total ascent of 2900 feet. I was definitely slowing down the group, having to walk some of the ascents and on the second “easy” half after all the peaks I was lagging behind. There was a really steep downhill that the others seemed to fly down; however I was really struggling as my thighs were protesting during the whole descent. At the end there was one more climb and joy when I finally recognised where we were. The run was 15.4 miles in 165 minutes (pace 10:45 min/mile). Later that day I decided to go out for a slow and flat run, managing 3 miles in 24 minutes – much slower than my usual pace. The next day I decided to do a real session, which involved running to the start point, difficult in itself as the others seemed to have boundless energy at their disposal. Then we did a variant of Fartlek, which is short periods of high effort (in this case 3 minutes), followed by the same period as an active recovery. We ran this for a total of 1 hour, turning around at 30 minutes and seeing if we could get back to the start point in the remainder of the time, beating our own first half. It was a really good exercise and I would recommend it to anyone, as you can both race yourself and others, as everyone should reach the start/finish at approximately the same time. This was then followed by a leisurely jog home. In the afternoon I decided to run to the pub to check there was adequate pathing/lighting for a nighttime run (this pub was set to be showing the football I wanted to watch the following day) – this was a simple round trip of around 5 miles. The next day I discovered I was injured, which was really annoying, especially as I was on track to reach the hundred-point challenge on camp (59/100 points at the halfway point). My left knee and Achilles’ began to hurt after a couple of miles so I cut short my run, deciding to rest the remainder of the day. The next day I decided to go for a walk, to see if my heel could take it – it was absolutely fine for a 4-mile walk. Then I decided to try a jog, making it half a mile before having to walk home – my camp was over! I decided to leave a couple of days early to avoid the temptation of running before my heel had healed. I’m a little behind on my blogging – apologies. I hadn’t exercised in a while, but luckily for me my parents (where I’m staying at the moment) bought an exercise bike. So far this bike has impressed me for the price. It’s pretty handy for seated work; however the resistance doesn’t go high enough to allow any real extended climbing work. I’d like to see higher resistance, but it seems really good for a beginner i.e. my parents. 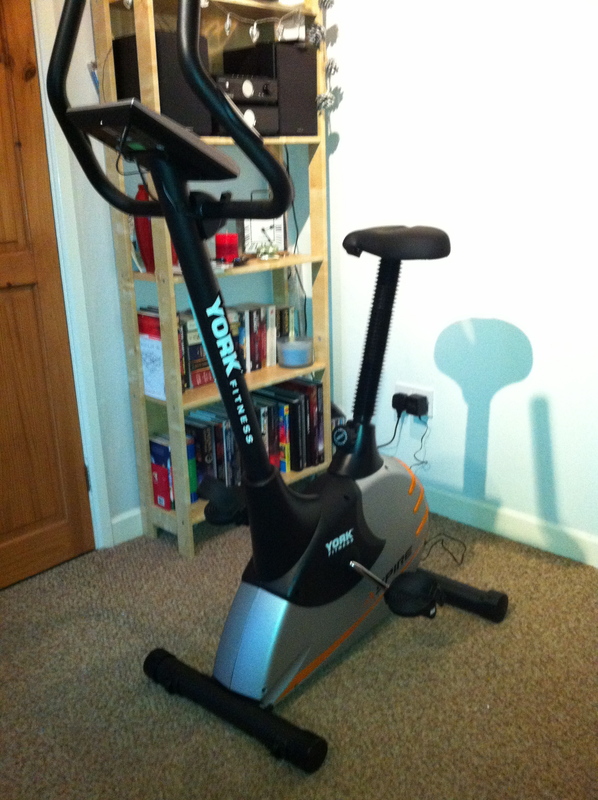 The last 3 days I have used the bike, whilst watching either a film or TV show – just like a real gym! On Tuesday I did 40 minutes of medium seated resistance, varying a little by increasing and decreasing the resistance periodically. Wednesday was an hour of cycling with much the same. Thursday (today) I went for my first run in a while with my brand new shoes I have bought for the running camp. 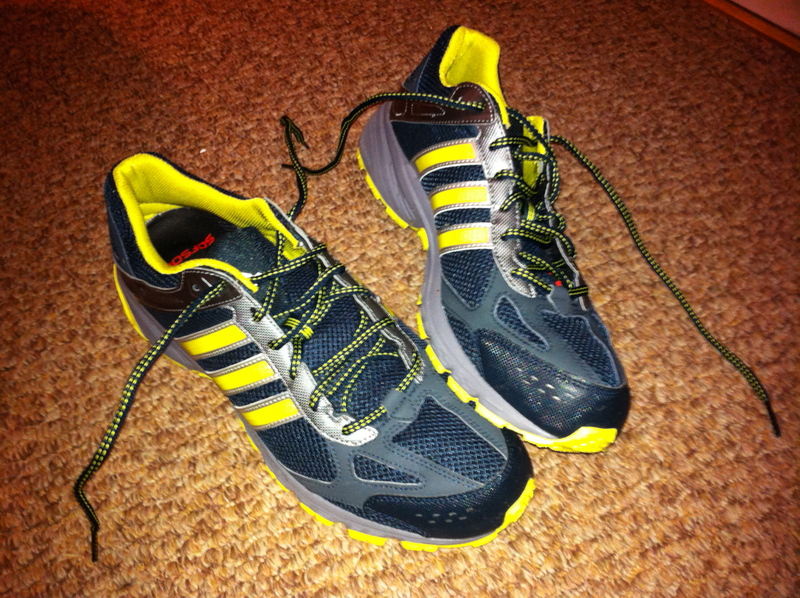 I bought new shoes to use on potential trails and uneven terrain. These shoes have more grip than my normal running shoes; however I have been informed that trail shoes generally have less support and so I bought a special insole to help deal with my pronation. For this reason I ran only 2.3 miles in 16 minutes, just to test the shoes and wear them in a little – everything went well, nothing to report really. I then returned home and cycled on the bike whilst watching The Walking Dead. I’m back in the north! This means I can finally do some hill training – as you may remember it was hills that derailed me during my marathon. Also I need to practice hills so I’m ready for the training camp in the peak district in about two weeks. On Saturday I started with a short-ish 6.7 miles in 48 minutes: I also ascended (and descended as it was a loop) nearly 600 feet, which is a lot considering the last run I did before in Cambridge (21 miles) I only ascended around 100 feet. It actually wasn’t as hard as I was expecting, but that may have been because what goes up must come down, allowing me to recharge my legs a little on the downward stretches. Today I ran 12 miles by extending the previous route by turning into unknown territory. Luckily there was a wind turbine nearby that I could use to orient myself. This 12 miles was done in 94 minutes, which is a little slower than usual and also slower than Saturday, but this is probably to be expected. So I had a few days off. Initially on Monday and Tuesday my legs were a bit stiff from the near-marathon I ran on Sunday. As time progressed I realised I was mildly ill, so I took it easy rather than risk getting more ill.
Today (Thursday) I was feeling better so I decided to go to the gym for a solo spinning session. I managed an hour and ten minutes of a mixture of exercises i.e. both seated and standing and sprints and climbs. I’m heading home to the parents’ tomorrow so I can finally start running some hills (Cambridge is very flat) in preparation for the running training camp I’m going to with the university running club in the peak district. This unfortunately means I have to pack several sets of running gear into my suitcase for a lovely train journey via central London. I decide to organise a long run today with the running club, as there wasn’t set to be one due to it being outside of term time. I only received one reply to the email I sent out; however this morning 5 of us met up. It turned out that the other 3 usually run with the training group rather than the EZ group like myself. This meant that they were accustomed to running further and faster than the EZ group. I managed to keep up with them relatively comfortably most of the time. We ran up the river and upon reaching the initial turn around point I still had the energy to continue, so 4 of the original 5 carried on. At this point the route was noticeably muddier and hence slippery again in my shoes of inadequate grip. It seemed that the others chose the route with the most mud, as I thought we would be running through the villages up that way, but instead we headed along tracks and footpaths and through fields. When we were nearly back I decided to nip off to work and collect my bicycle that I had left on Friday night after the lab party, adding an additional 3 miles or so to the route. It was at this point that I started to struggle, but I kept myself going with the thought that it wasn’t far. The total was 21 miles in 160 minutes with a pace of 7:38 minutes/mile. This is the sort of pace I really want to be aiming for in my next marathon, whenever that will be. No Sunday run this week; however we got up nice and early for a run with the club on Monday. I woke up to a light dusting of snow, so I took a few tentative steps outside and I did not slip at all – a pleasant surprise. I ended up taking the lead of the run and, after running a mile and a half from home to the meeting point I was ready to go. We ran a circuit of 5 and a bit miles, making my total 8.8 miles: running it in 68 minutes (pace 7:46 min/mile). Tuesday was a busy (and productive) day in the lab so I could only get out for a quick 30 minute solo spinning session. Unfortunately the spinning bike in the gym was taken so I had to wait for the spinning class to finish and sneak in for some solo work. Wednesday was another run with the club, but this time I was not leading: I was taking it easy as I was feeling a little more tired than usual. The total for the day was 7.2 miles in 56 minutes at a very similar pace to Monday. The route was not particularly exciting, we ran up the river which was nice, but on the return we ran through the middle of town, which was not as nice, partly due to its stop/start nature. Well I haven’t run for quite a while now, but I did squeeze in a couple of gym workouts. On Thursday I managed a brief half an hour session in the gym and on Friday I managed an hour and ten minutes of solo spinning after work. It was strange on Friday, as I usually recognise a few faces in the gym, but this time the Friday evening crowd must have been in. I also noticed one guy who came in wearing a fleece jacket – you know you’re not going to work hard if you’re wearing a coat in the gym. The Friday workout was largely the same as before, but I added in an extra bit: I started with a slow seated climb and kept increasing the resistance until I could barely push in time with the beat – I thought it was a nice change from all the standing climbs I usually do. I also forced myself to do some fast-paced parts and a couple of sprints, even though as you may know, I hate sprints.